Not many people know this about me but I love to cut people's hair. For some reason I've managed to cut hair just by observing someone else do it (doing it well is another story *laughs*). It started when I was in university. I casually mentioned to my mum if I can cut her hair and she (bless her brave soul) said ok! And I did! The end result was surprisingly quite nice although I took a reaallly long time because it was my first time cutting hair without any training. Mum just patiently sat there and told me, "it's ok, you need a model to practise." After many haircuts (she really trusts me! ), she decided that I should probably go take some lessons to improve my skill and sponsored my hairdressing course at Joo Chiat Community Centre (you can sign up for a similar course at PA). Course fees covered a plastic model head, a pair of scissors, a spray bottle, a bunch of hair clips and only 4 lessons of learning how to cut short hair. Our trainer was pretty good and despite the few lessons, I managed to learn the basics (such as how to hold the scissors and comb correctly) and improved my skill. Unfortunately I didn't continue with part 2 of the course, which would be teaching us how to cut long hair. 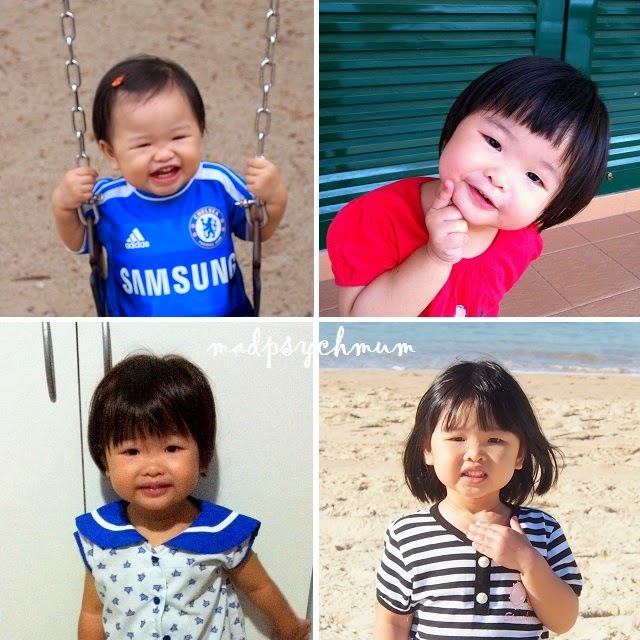 Hence till this day, I only know how to cut short hair but that's ok since I only cut my mum's hair (which is short). 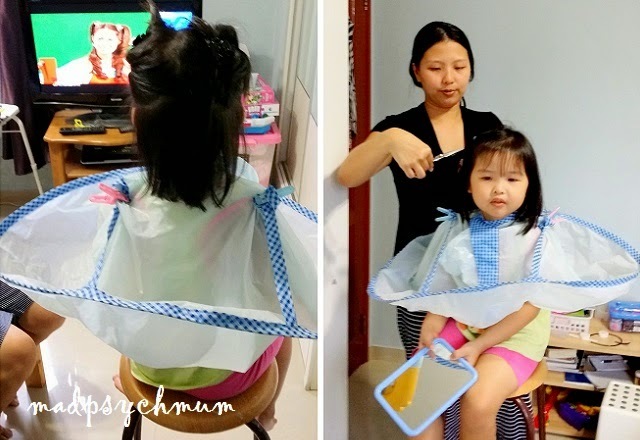 My girl has only been to the hairstylist once when she was around 1 year old and never went back again (even though it only cost S$3.50) because she hated it! It was such a struggle to take her that I decided it would have been easier if I did it myself. Only allowed to trim her hair because I was given orders that she wanted to have "Elsa hair"
Now that my girl is older and less able to keep still, I'm finding it harder to cut her hair. Added to the fact that I'm not as proficient with longer hair, it sometimes takes me a while to finish. But well I really enjoy it and with some entertainment, my girl's generally ok with it too.